Scroll down to the Single Item Page Settings section and switch on the Enable custom permalink. Scroll further down the page and click Save Changes. 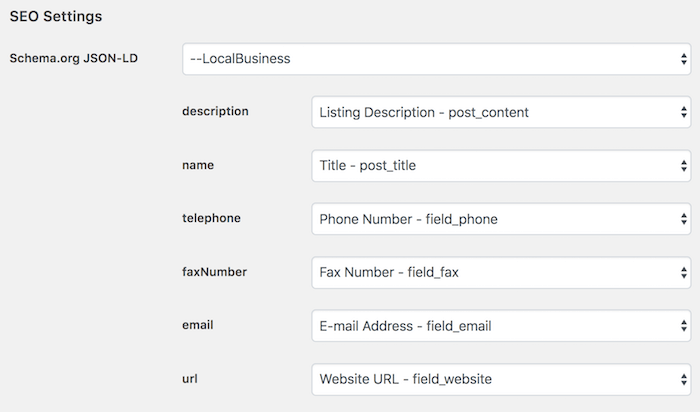 Structured data using the schema.org vocabulary is enabled by default for listings (LocalBusiness). When you visit a single listing page, an HTML fragment containing JSON-formatted structured data (JSON-LD) similar to the one below can be seen embedded in the HTML source of the page. Scroll down to the SEO Settings section. 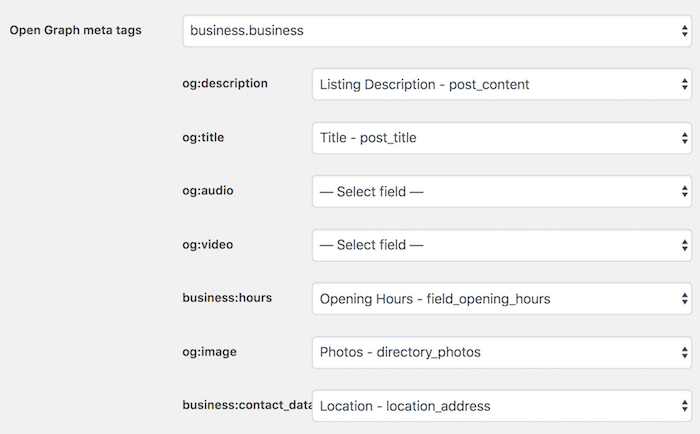 For the Schema.org JSON-LD setting, select a schema type that best describes your listings and map the properties of the schema type with listing fields. After making changes, scroll further down the page and click Save Changes. Scroll down to the Open Graph meta tags setting under the SEO Settings section. Select the type of Open Graph object that best represents your listings from the dropdown and then select a best matching listing field for each property shown below. Properties that you can configure change depending on the object type selected. See Open Graph Reference Documentation for the detailed information of each object type and its associated properties. Directories Pro is compatible with the breadcrumbs feature of Yoast SEO (https://wordpress.org/plugins/wordpress-seo/) and Breadcrumb NavXT (https://wordpress.org/plugins/breadcrumb-navxt/) plugins. If you currently have one of these plugins activated and its breadcrumbs feature enabled, then breadcrumbs should already display properly on directory pages.